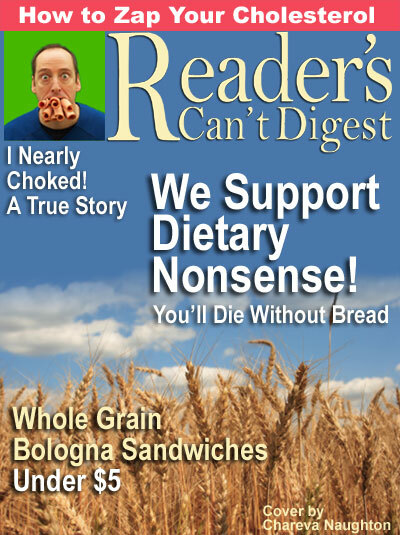 Reader’s Digest recently published an article titled “Why Low-Carb Diets Aren’t the Answer.” The article was full of the usual bologna, with a few side orders of pseudo-scientific salami. Curiously, the article was not credited to any particular author. I’m guessing the unusual anonymity is due to one of two reasons: the author doesn’t want to be on record when the article is shredded by real scientists, or he’s a food-industry hack whose conflict of interest would torpedo his credibility. Oh, I see. We must need lots of carbs, because that’s what “experts” recommend. Well, there’s proof for you. Open a textbook in biochemistry and look up “essential fatty acids.” You’ll find them listed. Look up “essential amino acids,” a.k.a. proteins. You’ll find them listed. Look up “essential carbohydrates.” You won’t find any, because there are no essential carbohydrates. Humans can live without any dietary carbohydrates whatsoever, and have done exactly that in cultures all over the world. So, according to Dr. Anonymous, we’re supposed to get most of our calories from the one macronutrient that isn’t biologically essential. If you’ve been living primarily on carbs and then stop eating them, you will indeed feel foggy – for a few weeks while going through withdrawal, which is what happened in the bogus NAS study. People also feel foggy when they give up smoking. Guess they’d better not quit; nicotine is obviously essential for the brain to function optimally. Meanwhile, I somehow manage to write complicated software programs while consuming perhaps 50 grams of carbs per day – closer to zero on many days. Okay, this one is just plain stupid. Studies show over and over again that ketogenic (low-carb) diets are superior for maintaining lean muscle mass while losing weight. If you starve yourself, then of course you’ll break down muscle tissue, but low-carb diets aren’t about starving; they’re about lowering insulin. I added a weight-lifting program to my exercise regimen this year and put on 16 pounds while losing fat around my waist. My legs and chest got noticeably thicker. If I’m losing muscle mass, then someone is injecting silicone into my muscles while I’m asleep. Meanwhile, low-fat, high-carb diets are notorious for slowing down the dieter’s metabolism. The effects on your heart are also questionable. Especially if you switch to a high-saturated-fat diet, as people do when they start eating their fill of steak and bacon, your “bad” LDL cholesterol will go up. When I went on a “saturated fat pigout” diet for a month – all the steaks, bacon, sausage, cheese, cream and butter I wanted, but no sugar or starch – my LDL dropped by 30 points. I know several other people who’ve had similar experiences. And frankly, the LDL number by itself is meaningless, because LDL can either be small and dense (the harmful kind) or big and fluffy (the harmless kind, which may even have anti-inflammatory properties). And guess which macronutrient tends to produce small, dense LDL? Yup … carbohydrates. Meanwhile, Dr. Anonymous conveniently failed to mention that increasing fat in the diet raises your HDL – you know, the “good” cholesterol. Whole grains. These protect against metabolic syndrome, diabetes, heart disease, stroke, and cancer. The idea that whole grains protect against metabolic syndrome and diabetes came from studies in which researchers compared the effects of eating white-flour products versus eating whole-grain products. Surprise! People eating the white flour – which spikes your blood sugar faster than sugar does – had worse health outcomes. The researchers then translated that result into “whole grain products protect against metabolic syndrome, diabetes, heart disease,” blah-blah-blah. Using the same logic, if I compare smokers to people who chew tobacco and determine that the smokers have a higher rate of lung cancer, I can declare that chewing tobacco protects against lung cancer. Low-fat dairy foods. Sure, you can have butter and cream on a carb-restricted diet, but you won’t get much calcium or protein from them. Fat-free and low-fat versions of milk and yogurt are excellent sources of those nutrients. Here’s a crazy idea: get your protein from meat. And get your calcium from spinach and nuts. Considering that pre-agricultural humans had amazingly thick bones without the benefit of raising dairy cattle, I’m pretty sure we can live without fat-free milk. Fiber. Getting fiber from these foods (except dairy) helps reduce the risk of heart disease and diabetes. Beans and many fruits and vegetables are particularly rich in soluble fiber, which helps lower blood sugar, curbs hunger, and lowers LDL cholesterol. Well, if the choice is between foods high in fiber and foods high in refined carbohydrates, which is the comparison that was used to tout the benefits of fiber, then Dr. Anonymous has a point. Otherwise, he’s full of the beans he insists we should be eating. And ain’t it strange that Dr. Anonymous is recommending fiber to lower blood sugar? How about if you avoid carbs so you don’t raise your blood sugar in the first place? Then you won’t have to lower it. But if Dr. Anonymous has convinced you that fiber is important, you can get all the fiber you need from broccoli, spinach, almonds, blackberries, and any number of other low-carb foods. If you load up on saturated fats—the original Atkins diet got as much as 26 percent of its calories from saturated fat versus the 10 percent or less that experts recommend—it’s bad for your health. Once again, saturated fat is bad for you because “experts” say so. Too bad the experts can’t point to any real science to back up that opinion. There have been several major studies that attempted to lower heart-disease rates by reducing saturated fat intake. They were all colossal failures. In one study, which lasted six months, the low-carb diet seemed to win hands down. The people on it lost nearly 13 pounds (6 kg); the low-fat dieters shed just 4 pounds (2 kg). But the second study lasted six months longer, revealing a truth about low-carb diets: The results don’t last. This study too found that the low-carb dieters lost more weight in the first six months, but in the second half of the year, the weight came roaring back. By the end of a year, there was no significant difference in weight loss between the two groups. Uh … what the data revealed is that people who didn’t stick to their diets regained all the weight. Lord knows that would never happen to people who stopped going to Weight Watchers or Jenny Craig. Jimmy Moore lost 180 pounds on the Atkins diet in 2004 and has kept it off. I guess the roar of his inevitable weight gain is simply inaudible. No matter how you slice it, we eat too many carbohydrates. We consume many more calories than we used to, and most of those extra calories come from extra carbs (so many chips and cookies!). Thus, it makes sense to cut back some on carbs. Wow … Dr. Anonymous got one right. Proof once again that even a broken clock is correct twice per day. Ok, being a dairy nut, I thought I’d explain why these are exactly wrong, not just intuitively wrong. b) Most of the calcium in milk is in incorporated into casein (a whole protein) aggregates in the milk, present in both whole and low fat milk. The removal of the fat is largely centrifugal, meaning they spin it really fast, the dense casein ‘sinks’ to the outside, and the less dense fat rises to the centre of the spinning apparatus, where it can be skimmed off (hence skim milk). This removes a large amount of the fat, as well as some water around the fat micelles. What is left is a more concentrated (due to the removal of the fat + water) mix of what is essentially casein solution. Thus, volume for volume, skim milk has more calcium, as it has more casein (by circa 20%). Spreadsheet programme A is programmed in C++, word processing programme B is programmed in Java. Therefore, to do any word processing, the programme you are using must be programmed in Java. That’s rubbish. I’ve been doing a mix of cardio and weight training, and the advice I recieved from a qualified trainer was that I should up my fat intake substantially. The reasoning, I have low body fat (<7%) and by doing this, my body has something in reserve to burn so that it doesn’t eat my muscles. The only reason that your body should be breaking down muscle mass is if you are a) inactive or b) starving. Nothing to do with carbs or fats. I’m envious of your low bodyfat! At my leanest, I’ve never reached that level. I remember talking to some bodybuilders in college who would go zero carb to get cut. Doesn’t sound like something they’d do if it ate up their muscles. To be fair about the essential fatty acids, they are all unsaturated to the best of my knowledge. So using this as an argument for saturated fats vs. carbs as a primary energy source probably wouldn’t hold up under scrutiny. To be fair about the glucose intake, most amino acids can be converted to glucose in the body, and most fatty acids can be converted to keto-bodies in the bloodstream (which can be substituted for glucose in bodily processes). These processes are strongly enhanced by exercise, which may explain my personal (and also widely reported by others) experiences of feeling more alert after exercise, and the strong evidence that regular exercise increases mental function. So while their claim that the brain needs glucose is empirically correct, the human body has evolved enough to know that there is more than one way to skin a cat. Exactly … the body can make the glucose it needs from dietary protein, which is why we don’t need carbs in the diet. And the irony is that when we eat too many carbs, the body converts them to palmitic acid … a saturated fat. I can’t even believe that this was written. Even pretending this was true on a diet that typically provides plenty of protein, where is the explanation as to why this would happen on low-carb versus low fat diet? Where is the explanation of how low-fat eating is supposedly so muscle saving, according to them, even if they gave some bs answer about needing carbs for energy? When I read the Reader’s Digest article, I nearly jumped out of my chair. The “you must eat carbs” crowd is fighting a rear-guard action, although the author wouldn’t put his name to this nonsense. I think the disclaimer theory is spot-on. Fantastic analysis of the article. You are fast becoming one of my favorite nutrition writers. I loved Fat Head, The Movie — I’m actually the person who wrote the first comment from Amazon you have listed on this Web site. I’ve recommended that movie to I don’t know how many people. As for all this weight lifting stuff… First, congrats on getting started on the weight lifting. I noticed you didn’t do it during Fat Head; I figured you didn’t want to complicate the story. In any case, I wanted you to know my story. I’m 46. I lost 35 lbs of fat on the Protein Power plan in 4 months (went from 30+% body fat to about 13%). At the same time I started the New Rules of Lifting by Schuler & Cosgrove. (I highly recommend it.) I have put on 20 lbs of muscle and kept my body fat the same while continuing to eat around 50-75g of carbs per day. The weight lifting and low carb are a great combination for making a healthy, functioning body. It’s been 2+ years since I’ve had a grain, potato, rice, or sugar. My blood chemistry must be all messed up without all those “essential carbohydrates”. Hmmm. Or maybe I’m healthy as I’ve ever been, playing basketball 3 times/week and lifting 3 times/week. I didn’t lift weights during the fast-food diet mostly because we suspended our YMCA membership while our girls were in diapers — not enough free time to make use of the place. But yes, lifting weights would’ve complicated the weight-loss story. The rubber-band gizmo helped prevent muscle loss during those years, but it’s not something that’s going to pack on new muscle to speak of. Glad to know we’ve got an unofficial marketing team out there, and I appreciate the very quotable review on Amazon. Thanks for the advert of your blog on Dr. Eades’s site, I didn’t realize you had one but I am usually interested in what you have to say over there. Nice movie recommendation (Idiocracy) I will have to check it out. Too bad nobody under the age of 75 still subscribes to readers digest or you could organize a subscription cancellation campaign. You said “The idea that whole grains protect against metabolic syndrome and diabetes came from studies in which researchers compared the effects of eating white-flour products versus eating whole-grain products.”. Not that I don’t believe you but I would love to see a reference to pass around to my naysayer friends. The blog is a recent development. I was a bit skittish about advertising it on Dr. Mike’s site, but heck, he’s a gentleman and obviously didn’t mind. I’ll try to dig up the studies about the whole grain thing this weekend. If you don’t hear back from me on it by next week, please give me a gentle reminder. I juggle the blog, marketing the film, family life and my programming gigs, and I’ve been known to forget a thing or two. Harvard study here. Note that they specifically replaced white flour with whole-grain products for study group. I’m pretty sure this is the study that led to all those “Whole Grains Prevent Disease!” stories in the media. A Cochrane review of whole-grain studies here. They pretty much come out and say the evidence is weak. I’ve heard so much about this stupid article I just wish someone would light a fire under Reader’s Digest and make them try to defend it. At least we’re in an age where those of us in the “pajamas media” can take them to task and provide a rebuttal that at least some readers will find. I do wish that people like the anonymous expert at RD would quit spewing dogma and start paying attention. Of course I read your study. I think it should be published in the New England Journal of Medicine … or Reader’s Digest at the very least. I have only been eating the low-carb WOE for only about one and a-half months, and yes, I did experience a feeling of detachment for about a week. After the initial week, however, I began to feel better than I had in many, many months. I wonder how the “unknown” author of this article would explain how so much of the inflammation in my system has significantly lessened after only one week on this satisfying way of eating; and, how he would begin to explain the lack of the “need” to stuff myself with the cookies, cookies and more cookies that I so desperately craved before? A lot of us had to go through “induction flu” for a week or two while re-adjusting to burning fat for fuel — as Mother Nature intended. 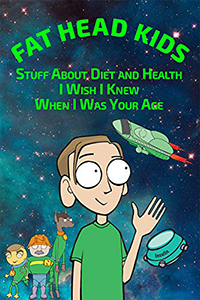 I started developing arthritis back in my heavy grain-eating days, and I was told by a doctor that I had a slight case of asthma. Both conditions are long-gone now. Thanks for doing this post! I happened to read this article just yesterday and was shaking my head. Sadly, I couldn’t refute it as eloquently as you just did. Excellent. My first reaction wasn’t eloquent, either. It wasn’t even appropriate for a family audience. Wow Tom, this post covers a lot of ground and we are entertained too. Thanks for doing it. I love to laugh and the Reader’s Can’t Digest cover kept me going for about 5 minutes, especially the photo of you with the “I nearly choked” copy below it. Saw the photo on the Eades site, saw it on the movie cover but for some reason this was extra hilarious. I think I will crack up every time I see it for a long time to come. My wife was the PhotoShop wiz for the cover, and I’ll happily pass your comments along to her. Just wanted to thank you for making the movie. I’ve watched it maybe six times so far and it still cracks me up. Love the scene in the parking garage with your lonesome car — the sound effects make it. Then there’s the customer walking away from $2.95 tofu salad, cursing the Guy from CSPI. Dozens of memorable moments. Honestly, at times I had tears in my eyes I was laughing so hard. I’m pretty sure you’ve set the record for viewing, apart from me of course. In editing and post, I had to watch it so many times, I grew numb to it. Thanks for the compliments, and sorry about that DVD player. Did anyone get to the end of the article? I read it and the last couple paragraphs made it all make sense. It’s an advertisement, if not an outright excerpt, of RD’s “Magic Foods” book. It looks like the book pimps low-GI stuff while still trying to adhere to the lipid hypothesis, hence the slagging of saturated fat and Atkins. Of course there was that study that came out in the last year [I think] that showed low-GI not to be all it’s cracked up to be. About milk, I’ve never seen where it says eating low carb means you can’t drink milk, excepting ketosis of course. Milk has about 11g carbs per 8 ounces. Given that even heavy cream contains 7g carbs per 8 ounces, milk isn’t that bad in reasonable amounts. Compared to any other kind of drink that isn’t diet or water, milk is pretty low carb. There’s also that crazy low-carb milk by Hood called Calorie Countdown (used to be called Carb Countdown), which, somehow, replaces most of the lactose with sucralose. I’ve read enough of the WAPF stuff to come back around to my childhood feeling that milk, especially whole milk, is a plenty good food choice. About yogurt, I was under the impression that fermenting milk lowered the sugar content of the milk, replacing much of the lactose with lactic acid. I read somewhere that carb content of yogurt was calculated, not measured, making the carb content listed on the label sometimes much higher than what is actually in the yogurt. Some sources here and here. That would make yogurt a perfectly acceptable choice in moderation on a low carb diet, even in ketosis, if careful in reading labels for added sugars. p.s. Hope my links work. WordPress allows html links doesn’t it? Do I need to use breakpoints between paragraphs when using links? Some old comment systems worked like that. PITA. Can’t preview either.. If you’re limiting yourself to, say, 50 grams of carbs per day, I don’t see why milk couldn’t be part of your daily total. I believe WordPress allows the links. I get heavy cream at Trader Joe’s. It says zero carbs, zero protein, 6 g fat on the label. Are we talking about the same stuff? They only list the counts by the tablespoon. I’ve seen nutrition lists for heavy cream that claim 6g/cup. The label “rules” allow any amount of <1 to be counted as zero. Since cream is usually listed by the amount in a tablespoon, which is <1, it can be listed as zero. This is also used in trans fat game, but then the hidden trans fat can add up to significant quantities depending upon the amount consumed. That makes sense. Of course, 6 grams still isn’t much, and I’m pretty sure I never drink a cup of heavy cream … sounds kinda good, though. Oh yeah! I forgot to mention, any WOE that is capable of eliminating the noxious fumes that used to emit from my dear, beloved husband of 29 years is definitely a winner in my book! So much for male bonding! My husband says he will just have to go find a can of “rotten egg” and take of the lid now and again! Again, I wonder what our “unknown” author would have to say about this benefit to people sharing the same household! Dr. Anonymous would no doubt claim that a lack of those fumes has been shown to inhibit proper brain function. What’s really depressing is that, comparatively speaking. lots of people are going to read the Reader’s Digest perpetuation of anti-low-carb drivel, and far fewer–and the majority of those already in the know–will read your excellent refutation of it. Your blog is a great addition to the low-carb community. Keep writing! That’s what was so annoying to me; I see that magazine all over the place, including in a lot of dentists’ and doctors’ waiting-rooms. You know I am a fan of yours. Keep up the good work etc. However, one thing in your reponse does bother me slightly. The Readers Digest article states that if you eat no carbs (or very few carbs), you may lose muscle mass, this will reduce metabolism. My understanding of human metabolism suggests this could be correct – ish. The body does need glucose to operate (the brain uses quite a lot). If you eat no carbs, the only place you can get glucose from is conversion of amino-acids to glucose in the liver. Ergo, assuming you are in energy balance. Eating no carbs could result in reduced muscle mass. And muscle does have a higher metabolic rate. A small point, perhaps, but the pedant in me shall not be quelled. Tell me I’m wrong and I shall buy you a beer. Maybe even two, because American beer is so weak that you need two to have any effect. Hi, Malcolm. If I understand the process correctly, as long as there’s enough protein in the diet, the body will covert those amino acids to glucose. Even on low carb diets, say 50ish grams, I’ve put on muscle while shedding fat, so I would think I was in energy deficit. But we’re in total agreement on the American beers, which is why when I indulge it’s usually Guinness or Bass, or both in the form of a black and tan. First round’s on you. Links appeared to work. Cool. I’m actually pretty sure the rules are that the amount of a macronutrient has to be <0.5g per serving to be labeled as zero. Since 1 cup = 16 tablespoons, there would be less than 0.5 carbs per tablespoon of heavy cream. Your brain will run just fine on ketones, after a few days of adjustment. No need for glucose. I’ve read many different and conflicting things on the conditions needed for protein to be converted into glucose, so this still seems to be arguable and in need of further research. As far as muscle mass, in the analyses of diet trials that I’ve read about, this seems to be almost completely a factor of dietary protein, irrespective of fat or carbs. When dieting, lean body mass is maintained on a high protein diet and lost on a low protein diet. Dr. Mike Eades covers this pretty good here. The thing is, most low carb diets are naturally high in protein. It’s at least one reason why they work. There are issues with physical muscle size involving muscle glycogen and water retention, but those factors seem to only matter to competition body builders. Well, I never drink of cup of heavy cream, but I will toss in a gram into my daily counts here and there, if I start counting again. For now, I just don’t eat sugar or starch. Whenever I add it up, it comes in at less than 60, which is fine by me. Gary Taubes also pointed out that even an all-meat diet isn’t quite zero-carb. There is some glycogen in the meat. I see someone else has already mentioned the WAPF. Let me tell you how I manage the dairy thing on LC. I eat cheese, of course, but to use regular milk I turn it into kefir. I got grains off Freecycle, and it’s not what it sounds like–they’re actually a symbiotic mass of bacteria and yeast, and it looks like a cluster of gelatinous white grains all stuck together. You put those in a clean jar with a quart of milk and let it sit out for a day or two until it’s as sour as you’d like. Not only does it eat up the lactose but it adds B vitamins and vitamin K due to the bacterial activity. I’ll make mine into smoothies or add Splenda if I’m in the mood for something sweeter, but you can drink it straight. It even seems slightly fermented, often bubbly. It’s a big hit in the Caucasus, over in Eastern Europe. You can get a starter too but the grains last a lot longer. There’s usually someone selling them on eBay. I have had intermittent problems with my knees for years. It culminated in realizing that I could not ride in the back seat of a car for two hours without having to stop every thirty minutes to stretch my legs or I would be in agony by the time we reached our destination. We’re talking pain and popping and abject misery. At other times I could tell when a storm was coming because one or the other knee would hurt when I walked down stairs. I went on Atkins and the pain completely vanished. I could last the entire two-hour car trip, I could weather any storm (ha ha)… it was awesome. I even had fewer repetitive motion issues in my hands. Also, I have a tendency to migraines, and I get a lot fewer of those when I’m in ketosis too. I’m another one who noticed a lot less stinky gas while LCing, as well. If I eat more grain foods it comes back. And I’m a woman. Hahaha. And the mental thing. God. I used to get the most horrid mood swings before I started low-carbing. (I’m on again, off again, but I’ve never gone back to quite as bad a carb intake as I had before the first time I started Atkins.) It was far worse when I was hungry. Went on LC and… everything evened out. It felt exactly like being on antidepressants only everything in my body worked properly. Ahem. And I could think more clearly too, once I was out of induction fog. Do these people even ASK anyone who’s done the diet right? Probably not. I started getting arthritis when I was a big grain-eater. It’s gone now. The asthma is gone too. My wife also noticed starches caused her to experience mood swings … she was a terror (for her, anyway, which would be categorized as “a tad cranky” for a normal person) after a batch of pancakes. Makes me wonder how many kids have meltdowns due to bloog sugar-crashes after eating all those wholesome, low-fat cereals. When Cocoa Puffs can sport the American Heart Association label on the box, something has gone seriously wrong. Pingback: Thursday 4/9/09 « Get up, get fit! How do rights work on blog posts and comments? Can I print this and mail it to Readers Digest as long as I specify where it came from? Ah, I’m going to anyways. It’s interesting to see that every one of the 10 comments on the RD article come out in defence of low carb diets, and trash the article. The good word must be getting out somehow. Let’s hope. But we’re a bit of a self-selected group here; people who liked Fat Head are pre-disposed to disagree with the RD article. I keep expecting to hear from the PETA crowd. I LOVE your stuff Tom and support you 100%. I appreciate the support. The blogging is a new venture for me, and I’m really enjoying it. Sorry, I didn’t make myself clear in my comment above: I meant that the comments on the Reader’s Digest site are all trashing the article. Not one single comment agrees with Dr Anonymous. I enjoy your blog very much, and I loved Fat Head when it was shown here in NZ. Ah, I see. I haven’t seen the comments on the RD site. That is encouraging. Maybe the tide is turning. I’ve heard media pundits decry the loss of “community” that we supposedly all shared before the internet and alternative media splintered the audience. Given how often what we “shared” was a biased message from a few sources, I’m personally delighted by the change. Its no wonder major media companies(newspapers, magazines, tv) are going out of business. People can see straight through the crap they write and pass off as journalism. Thank you for posting this. They are definitely shooting themselves in the foot. I lost lots of weight and my family were interested in how I’d lost it etc.. I tried to get them to watch G.Taubes’ Lecture on the net but they found it too scientific for them to grasp – Luckily, i found FATHEAD and they watched the whole of it, as it was funny, and they’ve now followed LC and they’ve finally lost the weight they wanted to get rid of ! What angers me is the Medical Profession won’t accept they’ve made a mistake. People say I’ve just lost muscle – (14.5st / 203lbs) of it apparently. Those who say I’ve just lost water – its amazing that loss of water also means loss of adipose tissue waist 54inches to 36inches ! 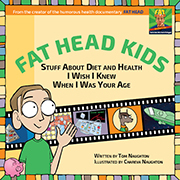 FATHEAD was great, my family finally understand that to lose weight they’ve got to cut C as they’ll make the body produce Insulin (the fat producing hormone) which has Alpha Glycerol Phosphate – which binds triglycerides & fatty acids together to produce Adipose tissue. Keep up the good work Tom ! When they’ll admit they’ve been putting us on the wrong diet – one which makes our bodies produce VLDL i do not know – It’ll probably be wishfull thinking that they will. Then again losing my fat was once wishfull thinking its not anymore ! As someone pointed out, scientific progress is often the result of funerals. The old guard has to go away and take their biases with them. Gary Taubes had to decide early on if he was writing a book for the general public or the academic/scientific crowd. He chose the latter because they’re the ones who are driving the misguided agenda. I like to think we’re fighting the same war, but on two different fronts. To be pedantic, many people do find that low carbing will increase LDL. However the crucial part is that it will almost inevitably slash trigs and increase HDL thus making the LDL less harmful, and tweaking the amount and type of fats, especially those yummy sat fats, in the absence of toxic levels of carbs and insulin, may well bring down the LDL and further increase the HDL. So they came a bit close to a fact there but turned away at the last moment. they even did a followup which was equally savaged – and bear in mind the comments that are left have been seriously edited. Yes, the LDL figure is meaningless unless you also know the particle size. Big, fluffy LDL doesn’t penetrate the arterial wall. It may even have anti-inflammatory properties. Cutting carbs tends to produce fluffy LDL. I remember reading up on the egg study. Buried fairly deep in there was a throw-away comment that the subjects who are more eggs were also more likely to smoke. At that point, I had a very strong WTF reaction, given that smoking is probably the #1 cause of heart disease. Makes sense, though. Since eggs have been demonized, people who eat a lot of them (excluding those of us who know they’re not harmful) are likely to be unconcerned about their health in general. Hi there. Not totally agree with you, but you just gave me an idea for a new eBook regarding \”d » Digest Some Bologna, Readers\”. It is related to cocoa puffs nutrition facts. Thanks.